Oh what an epic tale of a lost meatball in the form of a ballad… there was no point to that, I just had the song in my head. 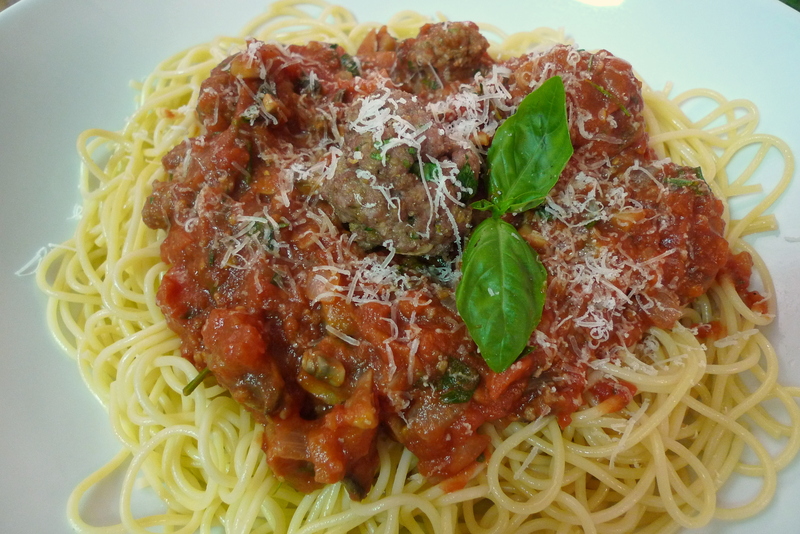 Anywho, classic Italian-American dish: spaghetti and meatballs! I recently discovered how easy it was to make meatballs, and so now I always make my own meatballs rather than going the ground meat sauce way (well, except in times of extreme laziness). The resulting recipe borrows elements from Jeremy’s recipe on AllRecipes.com, Rachael Ray’s recipe from FoodNetwork.com, and my own tinkering. Serve with a Caprese Salad and some crusty Garlic Bread! Bring a large pot of water to a boil. Add a dash of salt and your spaghetti pasta. Cook 8-10 minutes until tender (or less for al dente) and drain. TIP: Drizzle some EVOO over the drained pasta and toss to prevent the pasta from drying out and clumping together. Set aside. In a large bowl, mix the meat, bread crumbs, parmesan cheese, beaten egg, garlic, basil/parsley, salt and pepper. 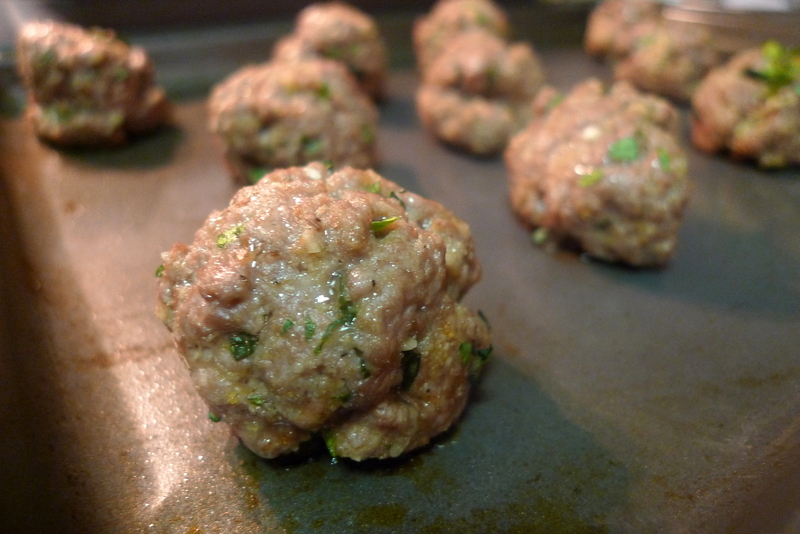 Roll the meat mixture into 1 inch balls and place on a nonstick cookie sheet. 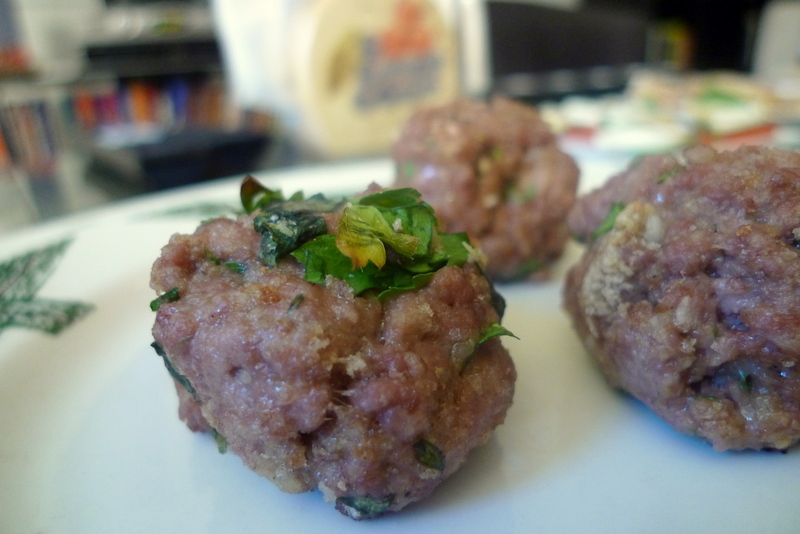 Bake the meatballs for 10 minutes or until no longer pink. In large pot, heat the EVOO over medium heat. Add the crushed red pepper flakes, salt, pepper, garlic, onion, and mushrooms and sauté until tender. Stir in the chopped tomatoes, parsley, and basil until the herbs have wilted. 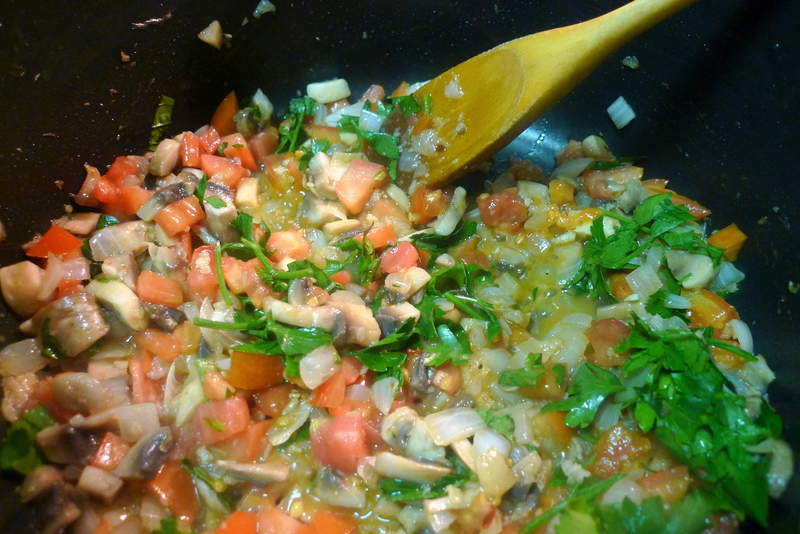 Add the crushed tomatoes, tomato sauce, and bay leaf. Cover and let simmer for 10 minutes. 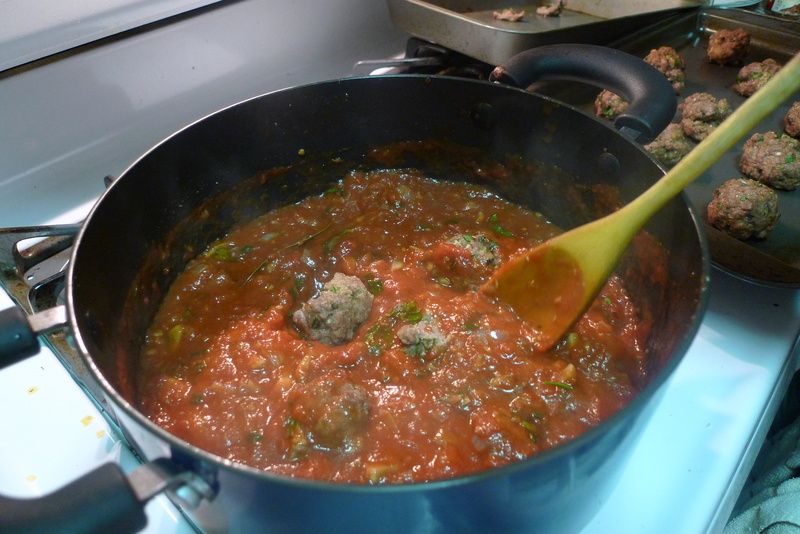 Stir in the meatballs (I like to let break a few of the meatballs up in sauce) and let simmer for another 20-30 minutes (or whenever you think it’s ready aka when you are hungry and can’t wait any longer). 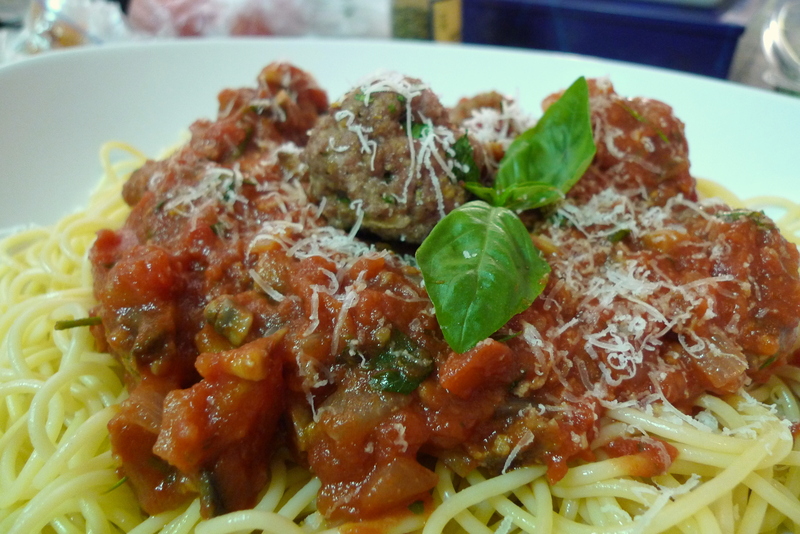 Ladle the meatballs and sauce on top of the spaghetti pasta. Sprinkle some freshly grated cheese on top and enjoy!